When Daft Punks Electroma was unveiled in the Directors Fortnight at the 2006 Cannes Film Festival, it was met with at best a muted response. Writing for Variety, Leslie Felperin chastised bandmates Thomas Bangalter and Guy-Manuel de Homem-Christo, who bizarrely choose not to use their own catchy tunes here, the one thing that might have given pic slim commercial legs. Felperin also invoked such cinematic endurance tests as Gus Van Sants Gerry and Vincent Gallos The Brown Bunny, and called the plot risible and had aud at projection caught ankling in drovesVariety-speak for the high volume of walkouts it inspired, which explains why its premiere received scant coverage. 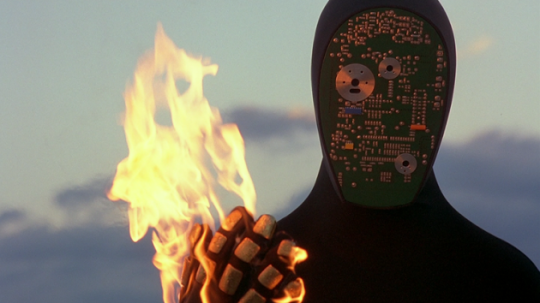 A ready-made cult film with no spoken dialogue and only a handful of songs with lyrics, Electroma found its audience among the Daft Punk faithful at midnight screenings the following year, but those who missed seeing it in theaters must be willing to part with upwards of $100 if they want an unopened copy of the out-of-print Region 1 DVD. More frugal fans with a subscription to Tidal can opt for the tenth anniversary edition the band released exclusively on the streaming site last year or make do with one of the numerous versions of the film that have been uploaded to YouTube, one of which comes with an alternate soundtrack culled from Daft Punks own catalog. The one curated by the band and music supervisor Steven Baker is perfectly suited to the film, though, progressing from Todd Rundgren to Brian Eno to Curtis Mayfield to choir music and beyond. Their choices say a lot about how wide-ranging their musical tastes are, which would be less evident if they had merely dropped in tracks from Human After All, their then-current record. The urge to venture into new arenas continued with Electroma, which began life as a video for Human After Alls title track, but quickly expanded its scope to tell a complete, if simple, story about two robots and their doomed quest to become human. Hero Robot #1 and Hero Robot #2 arent just any robots, though, since they wear Thomas and Guy-Manuels signature helmets and the black leather outfits that were the bands uniform at the time, complete with their logo spelled out in metal studs on their backs. 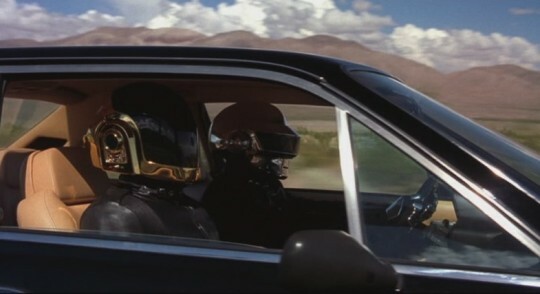 So, even though they arent played by Bangalter and de Homem-Christo, who were busy enough handling directing duties (with Bangalter doubling as cinematographer), they are Daft Punk for all intents and purposes, and the scenario devised for them by Bangalter, de Homem-Christo, Cdric Hervet (also the films editor and script collaborator on Interstella), and Paul Hahn (also its executive producer) can be read as autobiographical if viewed from the right angle. The film starts on colorful rock formations in the California desert, where a black Ferrari with the license plate HUMAN awaits our heroes. So does a fiery reckoning, which the flames under the title prefigure. There are, in fact, a number of cutaways to these flames sprinkled throughout the film, starting with the scene of Thomas and Guy-Manuel driving down an empty highway (shades of the opening car ride in Gerry) to the accompaniment of Todd Rundgrens International Feel. So far, so normal, but then they pass a tractor ridden by a robot farmer with a Guy-Manuel helmet, which doesnt prepare the viewer for the sight of a whole town where every man, woman, and child from all walks of life is a robot sporting their headgear as Rundgrens spacy 70s rock gives way to Brian Enos moody instrumental In Dark Trees. When Daft Punk’s Electroma was unveiled in the Directors’ Fortnight at the 2006 Cannes Film Festival, it was met with at best a muted response. Writing for Variety, Leslie Felperin chastised bandmates Thomas Bangalter and Guy-Manuel de Homem-Christo, who “bizarrely choose not to use their own catchy tunes here, the one thing that might have given pic slim commercial legs.” Felperin also invoked such cinematic endurance tests as Gus Van Sant’s Gerry and Vincent Gallo’s The Brown Bunny, and called the plot “risible and had aud at projection caught ankling in droves”—Variety-speak for the high volume of walkouts it inspired, which explains why its premiere received scant coverage. A ready-made cult film with no spoken dialogue and only a handful of songs with lyrics, Electroma found its audience among the Daft Punk faithful at midnight screenings the following year, but those who missed seeing it in theaters must be willing to part with upwards of $100 if they want an unopened copy of the out-of-print Region 1 DVD. More frugal fans with a subscription to Tidal can opt for the tenth anniversary edition the band released exclusively on the streaming site last year or make do with one of the numerous versions of the film that have been uploaded to YouTube, one of which comes with an alternate soundtrack culled from Daft Punk’s own catalog. The one curated by the band and music supervisor Steven Baker is perfectly suited to the film, though, progressing from Todd Rundgren to Brian Eno to Curtis Mayfield to choir music and beyond. Their choices say a lot about how wide-ranging their musical tastes are, which would be less evident if they had merely dropped in tracks from Human After All, their then-current record. The urge to venture into new arenas continued with Electroma, which began life as a video for Human After All’s title track, but quickly expanded its scope to tell a complete, if simple, story about two robots and their doomed quest to become human. Hero Robot #1 and Hero Robot #2 aren’t just any robots, though, since they wear Thomas and Guy-Manuel’s signature helmets and the black leather outfits that were the band’s uniform at the time, complete with their logo spelled out in metal studs on their backs. So, even though they aren’t played by Bangalter and de Homem-Christo, who were busy enough handling directing duties (with Bangalter doubling as cinematographer), they are Daft Punk for all intents and purposes, and the scenario devised for them by Bangalter, de Homem-Christo, Cédric Hervet (also the film’s editor and script collaborator on Interstella), and Paul Hahn (also its executive producer) can be read as autobiographical if viewed from the right angle.